On 28 June 2010, at the port of shipment of the Cam Pha Cement Factory, the Cam Pha JSC. of Vinaconex Corporation exported 15,000 tons of clinker to foreign markets. Once again, the Company pioneered exports of clinker to overseas markets after a long period of studying, searching and striving with best efforts. This event also affirmed improvement of the Company’s business strategy and operation in the circumstance of surplus of cement supply in the domestic market as forecasted. In the evening 19/6/2020, the Vietnam Intellectual Property Association held a ceremony to grant the “Competitive and Famous Brand of the year 2010” title to enterprises at the National Convention Centre. In two days (from 6 to 7 June 2010), Mr. Nguyen Van Tuan – Chairman of Vinaconex JSC attended the World Economic Forum (WEF) on East Asia on “Rethinking Asia’s Leadership Agenda” in Ho Chi Minh City. In the evening 26 May, Vietnam Construction and Import-Export Joint Stock Corporation were honored to receive the National Brand 2010 Prize at Hanoi Opera House. On 10/05/2010, the VINACONEX Tourism Investment and Development Joint Stock company (VINACONEX ITC) listed its 30 million shares with VCR code on HN Stock Exchange and became the 18th subsidiary company of the VINACONEX Group to list shares on HNX. On 8 May 2010, the opening ceremony of VINACONEX Real estate exchange was held at Trung Hoa Nhan Chinh Urban area. 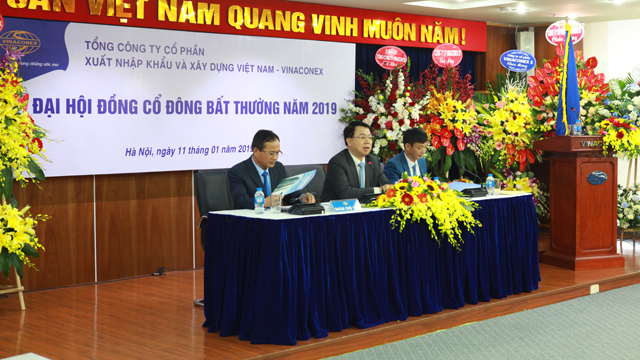 At tenders included Mr. Nguyen Tran Nam – Deputy Minister of Construction, President of Vietnam Real estate association, representatives from departments of the MOC and Hanoi city. From the VINACONEX JSC., Mr. Nguyen Van Tuan – Chairman, Deputy general directors, representatives of all departments, and directors from subsidiary companies of VINACONEX JSC. joined the event. VINACONEX took part in the conference of “Vietnam Finance and Capital market" and "Gateway to Vietnam"